Remember that temple from Priest in Peril, just east of Varrock? Go there and talk to some hooded monk outside of it to start the quest. The hooded monk will ask you to make him a bow-sword for the aid of some warriors. Go to Falador, withdraw your mithril 2h sword and a bowstring, then run north towards Doric's house. If you don't have the 2H sword, run east to Taverley and buy one from the 2H sword store for 2,600 gp. Once at Doric's house, use the mithril 2H on the whetstone to turn it into a slender blade, then use the bowstring on the slender blade to make a bow-sword. Head back to the hooded monk and hand him the blade. The hooded monk will ask you for another favor. A ceremony is being held at Entrana, but the hooded monk can't make it. He tasks you to attend it in his place, and deliver a gift. He hands you an Orb and wants you to give it to the monks of Entrana by surprise, so you simply can't take a boat there. Instead, you'll have to reach Entrana via the Abyss. Head over to Edgeville now. If you don't have a Large Pouch, you'll have to spend some time in the Abyss. The Abyss is a dangerous multi-combat zone which will drain you of your prayer and skull you if you don't have an abyssal bracelet. 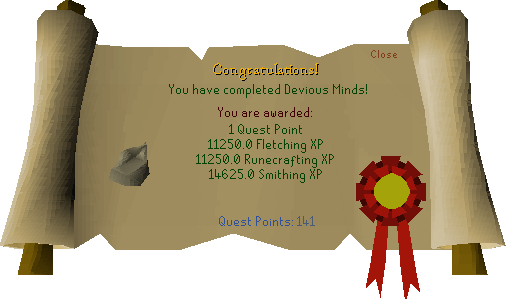 Kill the monsters inside until you get a Large Pouch, the easiest monsters being the Abyssal Leeches, and then return to Edgeville. Note that you can't get a Large Pouch unless you have the Medium and Small pouches too. Once at Edgeville, bank all of your weapons and armor and withdraw just your Large Pouch and the monk's Orb, take some runes to teleport to Varrock and Falador if you can. Head into the Abyss, and talk to the Dark Mage to repair your pouches, just in case. Use the monk's Orb on the Large Pouch, and then run into the Law rift, and exit the Law Altar, leaving you on Entrana. Run over to the temple just south-east on Entrana, and use the your pouch on the altar. A cutscene will play and some CRAZY stuff will go down. The High Priest will talk to you, and now head back to the hooded monk. Search the dead monk, return to the High Priest at Entrana, and talk to him. He advises you to talk to Sir Tiffy Cashien at Falador Park, so head over to Falador. Talk to Tiffy to finish the quest!